As the average credit card debt carried by Americans, and indeed by people in countries all over the world, continues to increase more and more people are actively seeking out credit card debt assistance to help them figure out just how to resolve their problems. Credit cards themselves are not necessarily bad things and the way the world works these days they are no longer the novelty or luxury they were when they first appeared in the 1960s and 1970s but instead almost a necessity. Even though debit cards can be used in the place of credit cards for many things these days – bill pay, shopping on-line – it can still be hard to book a hotel room or rent a car unless you have a credit card. And having a credit card is about the only way a young person can build up a credit rating – something that must have in order to secure a mortgage or a car loan, two things most young people aspire to do. Your credit rating can also affect everything from the price you party for car insurance to your job prospects so building up a good one is very important. So in essence credits cards are a “necessary evil”. Many people who find themselves in trouble with credit card debt are not reckless or extravagant spenders. Many of them are actual very careful with their credit card spending but fail to realize just how big of an impact the interest charged on any balances they carry from month to month will have on the actual amount they end up owing on each credit card they have. Before they really know what hit them their monthly payment are all going towards an ever increasing amount of interest while the actual principle remains untouched. It’s a vicious cycle that can be hard to get out of without some serious planning and help. Whatever you may have heard simply canceling your credit cards is not a good idea as doing so will impact your credit score negatively. Instead put all of them away except the lowest interest card and use that only in emergencies (to secure a hotel room, rental car etc.) This can be hard of course and people do come up with interesting ways to ensure that they at least think before they spend. Whenever you receive your credit card bill you are given the option to pay a minimum payment. That minimum payment is often as little as 2-3% of the total balance you owe (principal and interest) So if you have a balance of $2,500 this month even a $50 payment is going to be applied mainly to interest owed only. By paying even just a little bit more than the minimum payment due every month you will begin to decrease the debt more quickly than you might have imagined. If you have several credit cards it makes sense financially to attack the high interest balances first. And if you do have the chance to transfer some of your higher interest credit card debt to the lower interest cards it is definitely something worth considering. Whether you use a notebook or a complicated computer program if you keep good track of every payment you make it can be a great motivator as you will actually be able to see the debt decrease, which should spur you on to keep going. 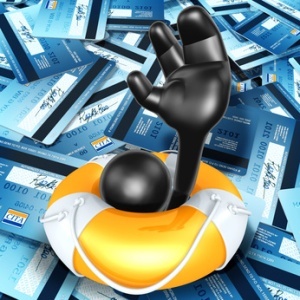 There are a growing number of companies that offer all kinds of credit card debt assistance services. Some will just offer advice, encouragement and planning help while others offer to negotiate with credit card lenders on your behalf to secure payment plans. You should tread very carefully if you are considering this route to relieve yourself of your credit card debt worries. Although there are some great and very helpful companies and services out there are just as many scammers who are happy to take your money and give you very little if anything in return. As a consumer you can usually negotiate with creditors just as well as some of these companies can, it just takes time and patience.